There are novels that you love, even if they aren't great (for me, Twilight). There are novels that you think are great, even if you don't love them (say, Cosmopolis). Then there are those rare novels that you both love and think are great. 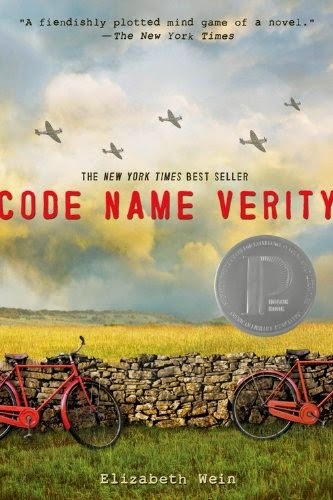 Code Name Verity is one of those for me. It's the story of two young women during World War II, one of whom is a pilot and the other a German-language interrogator. They are English, and best friends. Light spoilers: They end up stranded in France, one hiding with members of the French resistance and one in the hands of the Nazis. The author, Elizabeth Wein, builds some impressive architecture here. There is enormous historical detail, but it never fights with the story. She's got two narrative voices—those of her two young friends—that are distinct and realistic. She finds a way to have each girl tell her story as it happens—not an easy task when one is living in a barn and the other in a cell. And she has a clever, oblique method for providing the big picture, little glimpses of what's going on in the next cell (which you'd really rather not know) or how the resistance is made up of both saints and jerks, often within the same individual. Best of all, these characters do incredibly brave things while never for one minute being anything other than what they are: very talented but also very normal young women at the beginning of their lives, being scared, missing their families, trying to do the right thing but wanting desperately to live.